MSNBC showed a picture of Wisconsin Gov. Scott Walker while talking about Phil Scott, the current governor of Vermont. Christine Hallquist, the Democratic candidate for governor running against Scott, joined MSNBC’s Ali Velshi to discuss her candidacy on Wednesday afternoon. Velshi noted that the race is currently rated “solidly Republican” and wondered how Hallquist plans to unseat the incumbent. While Hallquist was answering the question, MSNBC ran a graphic purporting to show Gov. Scott’s approval rating. The graphic, however, included a photo of current Wisconsin Gov. Scott Walker instead. MSNBC did manage to get Gov. 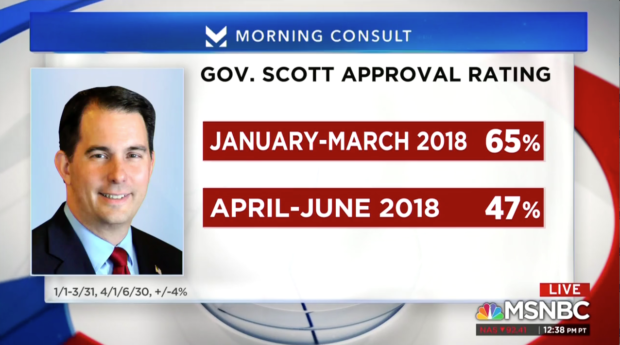 Scott’s approval ratings right according to a Morning Consult poll. That poll shows that Scott’s approval rating dropped a dramatic 18 percentage points between the first and second quarters of the year. “Vermonters are gonna elect me for what I’m going to do for them. That’s absolutely clear,” Hallquist asserted.